Between Write and Wrong: Who will write my biography? Who will write my biography? There are some questions which take you by surprise. You are surprised because you wonder how come you never thought of them. You are also surprised because you will have to think before venturing an answer. Such questions are not intrusions, no. They strike you like a flower dropping from a tree and onto your head. Your reflexes cannot hide the ‘What was that?’ but when you take in the question, it’s a beautiful thing you discover. Like the flower the tree let go of. I was asked something recently – If I could have any author – living or dead – write my biography, who would I choose? I stood before the book shelves at home, ran my finger left to right on the spines, head tilted a little to the right. The books were throwing names at me, some popular, some not so. I could spot my favourite authors looking at me with a scowl, saying ‘traitor’, as my finger brushed over their names and ignored. I could see Sam Walton (Walmart?) bribing me with his smile, selling his biographer to me with offers attached. I even saw children’s authors of varied nationalities prattling ‘try me’, on books tucked secretly between the big people books, by my son. I didn’t pick any first, and then I picked three. Yes, a combination would be good. Why not! Let Mark Twain write about my childhood. Look what he did with Huck Finn and Tom Sawyer. You read about them as a child and you enjoy the adventures. You read them as an adult and you realize there is more here than meets the eye. Let Twain paint my childhood for me, for I too have climbed trees, had gangs of friends, tricked or treated them. Sought freedom from civilized society, created fiction and ‘some kind of a yarn’ (okay, lied) with ease that equals that of Finn. Like Sawyer I have domineered over my cousins, called pretend play adventures, thrown some style into it and how! And despite all “laws” that are supposed to govern childhood, sweet subversion has been my constant companion. And then, with characters like ‘Jim’ around, I too have thought ‘Human beings can be awful cruel to one another’. Twain would know, how the Finn in me grew away from the Sawyer. How, as children too, there were larger issues that we all handled. But then, I am no longer a child. I am a mother and am married to a man who is married to the Government. Something like ‘The Mammaries of the Welfare State’, with an ‘and’ in between, is what my daily life is. Yes, Upamanyu Chatterjee would understand the comic fable that is a part of our pillow talk night after night. I want this part of my life to be put in the best, most savage satire which makes you laugh– exactly what my life comprises right now, and will for a little while. Who else will know from firsthand experience how opening your own car door is as anathema as cleaning your toilet with your toothbrush, or picking your own bag! That ‘Efficiency Bar’ that ‘Hubris Ascending’ and even that ‘Pest in the Corridors of Power’. Yes, no one can document this wifely stage of my life as Upamanyu can. However, these are the external trappings of the person I call me. Stimuli which shape me, but are not me. After all, who am I, if not my thoughts? My streams of consciousness. Descartes said ‘I think therefore I am’? Should not my biography be about what is within me as much as what is without? There is only one author who surpasses all others when it comes to portraying the reality of her characters, and that is Virginia Woolf. Her novels have dealt with memory and her characters, like Mrs Dalloway, have been thinking minds, not just material beings. My reality is my thoughts, and Woolf will know how to pen them down. Put into words what was storming my mind even as I served tea in china cups, with a broad smile. Or waved good bye to my son leaving for school with a similarly painted smile, but a heavy heart. I sit staring at these three books before my eyes. These three, together, will write my biography for me. But something doesn’t seem to satisfy, still. Something is amiss. These people are masters at their craft but strangers to my life, my times. Yes, like most biographers are. But then, if I could I would want someone who saw me live my life to write about it too. Who was there when my tomorrows became yesterdays as the road-roller of time laid the path to old age. Who was a witness to the greying, and his own growth in my hands. Who will know how to fill in the gaps, of incidents and feelings, when my memory fails to sit by my side. Let my son write my biography, if my life is indeed worth a tale. Let my biography be my son’s story of my life. Who could better narrate your story but you? But not everyone can do justice to themselves and a different set of eyes, as you chose, are needed to see something that belongs to us but taken for granted, or dismissed as nothing. Even then, your own can do far more justice to such subtleties and nuances. I hope Nishad (I hope the spelling is all right) reads this, not when he is young, or when he is old, but somewhere in between when he isn't too young to not play with words and not too old to have grown weary of their consequence. I wish him, and you, the very best! Thank you. And best wishes to you too. Very few write like you! Maybe the son or who knows the husband can do a good job. Sometimes, we may not be completely conscious of certain facets of our own life and our interpretations may vary from those of others around us. Such an interesting question to ponder. You chose 3 good authors. Married to the government had me guffaw loudly :). Absolutely true, Rachna. So many things about our lives, our selves, must be hidden from our own eyes. Another's perspective will be interesting, surely. :) Would be yours too? Hmmm, tough decision to make. I wonder who can write a biography that is unbiased, true and worthy of us. I guess no one can do that, not even the person him/herself. Well, our lives and blogs tell our story so why a separate biography! Thank you for reading me today, Susan. Good to see you here! Interesting topic and imaginative choices. Apart from your family, who else can read your life and mind? Not easy. I would want my husband to do the honors. Loved the way you picked three different writers for three different phases in life. I dilly-dallied between the two men, and then picked the one who will take my story forward into times where I will be non-existent. Thanks for reading, Alka. Very interesting. I loved the choices of authors here and how your biography can be your son's story. Lovely. Now that is a very interesting thought indeed. When I first saw the prompt a few weeks ago, and saw your name next to it, I was quite curious to say the least. To actually see who you, one of the most well read people I know, would pick. Pretty interesting choices there. But yes, I'd love to see N write your biography! Now, that's a best seller right there ! I dont want a biography! Interesting read!! I think the son really is the perfect choice.. This post triggered a thought that I have already shared with you offline. I don't care much about your choice of two of these authors, but, yes, the third one could have written a spectacular biography on you. All three lovely choices of authors to write your biography with appropriate reasons, no doubt, but the fourth one just took the cake as far as I am concerned. Am sure little N will bring in that much required zest, enthu, and fun element to your life if he does indeed decide to write your biography. Wow so interesting you chose three difft authors for your three difft phases if life. But N writing your years, well that's perfect! Exactly my thoughts, Uma. Good to see you here. Thanks for dropping by! What apt choices of authors for the biography! The idea of a son writing on his mom is so nice! Hope ur son grows up to follow your footsteps. I probably would transfer the burden to my children (when I have them that is), to make sure that they are into reading and writing just like me. For now though I think no one knows my life as well as myself, the husband comes close but not close enough! If I could narrate it to an author, it would be Danielle Stell no doubt. Her books inspired me to write, I would love it if she could tell my story! Good choice there, Soumya. Yes, husbands come close but not close enough. I agree. That is why I turned my car away from him and towards my son. Purely hypothetical, but certainly a wish. 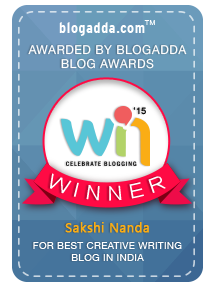 There is a special flavor to your writing I like to call it the Sakshi twist. Its got to be an autobiography or else I will miss that special Sakshi twist. Thank you, Prakriti. Good to see you here! Wonderful choices, the first and third. 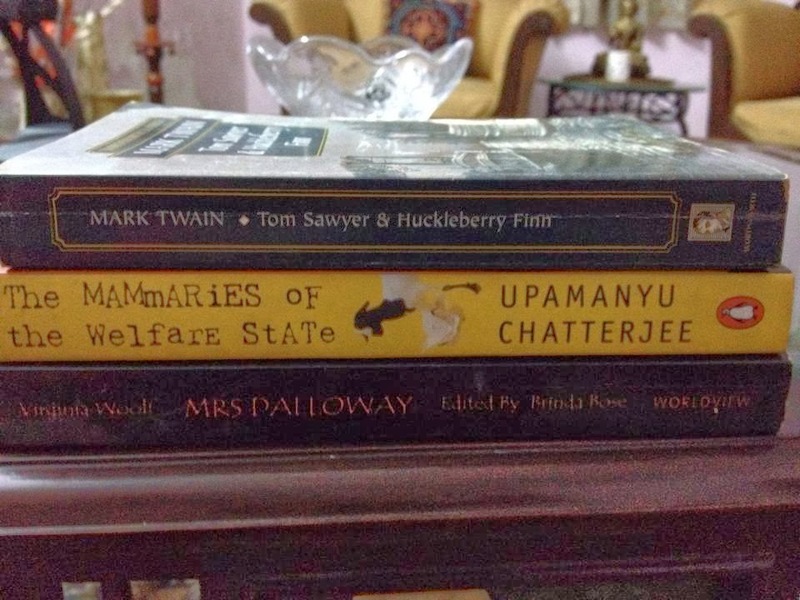 I haven't yet had the chance to read Upamanyu Chatterjee. Find time and read him. He may need a dictionary alongside, but I tell you, he's great!! Great post, and loved your choice of authors. And I don't know about biography, but I really wish my kids dabble into writing a little bit, and I get to read their perspective on their upbringing and their true, inner feelings for their mum n dad. I enjoy blogging about their antics right now, and look forward to the time when the tide will turn in their direction :)! Oh my wish too, Shachi. I want to read my son one day, and I don't mean just the school essays called 'My Dog' :D I want the tide to turn the other way too. I really want to know, through the written word, what my son thought of me, our family, our life together. I think our children would be the best to fit the job. They know us inside out and are a generation superior to us to judge us with clarity n purity. They are a generation ahead of us, and that will make them place us and our lives in a different time, almost. That would be very interesting to read, Neo. Hence, I picked my son. Plus, they will carry it forward too. Learn something and unlearn a thing or two.